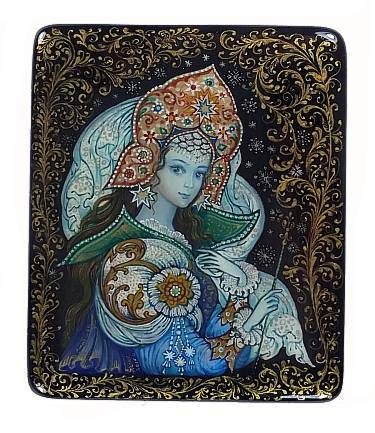 Surrounded by thick snow flakes floating in the air, and magestic golden patterns framing the scene, the Snow Queen is depicted in all her grandeur on this box. Her gaze, however, is timid and pure, yet not warm: there is a rather icy stillness to her expression. Her crown is defined by warm red and golden tones, which create a pleasant contrast with the rest of her cool blue attire. Her left hand points toward her heart, while with the right she is holding her sceptre, gently - almost as if uncertain of her own power. The Snow Queen is painted here with a sympathetic touch, as if revealing a tender, delicate nature behind her silent composure and still, icy gaze. 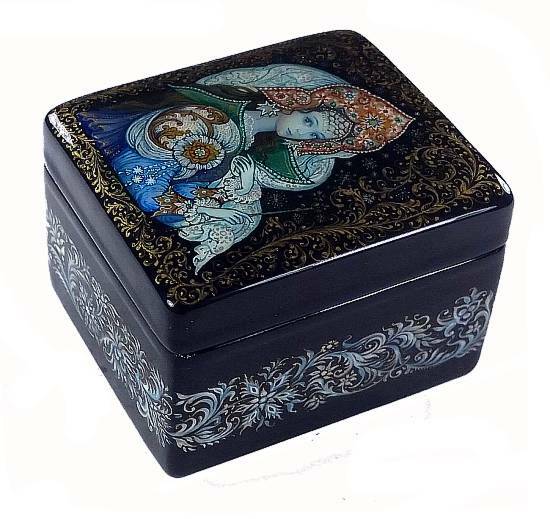 This charming work is painted on a high quality papier mache box. The box rests on four small round legs, and its sides are decorated with an elaborate gold, silver, and light blue paint ornament. The box opens without a hinge, and reveals a red interior. The artist's name, village, and year are painted on the purple-blue folds of the Snow Queen's garments, in the left corner of the box. Lacquer is in pristine condition.